Phase of the Moon on 15 January: waning gibbous with 98% of the Moon's visible disk illuminated. Full Moon on 14 January 2006 at 2:49 a.m. Mountain Standard Time. Sunrise: 7:15 a.m PDT, 8:15 a.m. MDT. Altitude of Moon at 2:00 a.m. PDT: 68.9 degrees. Azimuth of the Moon at 2:00 a.m. PDT: 190.8 degrees E of N.
Drop test for Stardust capsule and map of the general impact area. 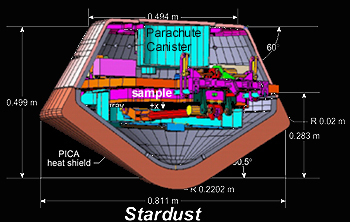 Stardust will release the SRC just prior to its final Earth encounter in the proper flight trajectory and entry angle. 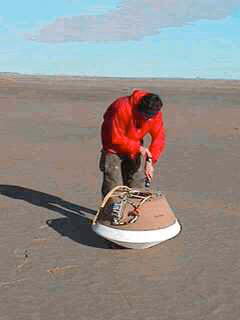 The capsule is given a spin when released. The capsule will enter the Earth's atmosphere at a whopping 28,600 miles per hour. After entry the SRC will continue to free-fall until approximately 10,000 feet, at which point the main parachute deployment sequence will initiate. 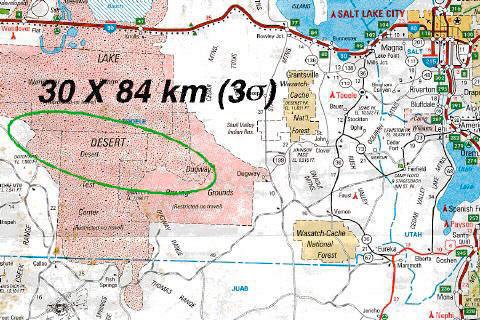 The planned landing site is the Utah Test and Training Range (UTTR), southwest of Salt Lake City. Falling slowly by means of the parachute, Stardust will settle down to the ground at UTTC and be collected by helicopter.